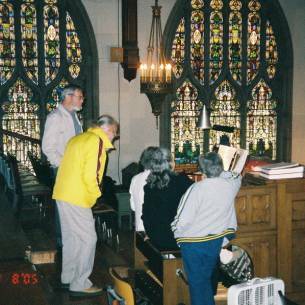 OHSers ponder the console of the magnificent Petty-Madden organ at Hartford Memorial Baptist Church. 2. How likely would it be that you would attend a meeting on a Sunday afternoon (2 or 3 p.m.)? 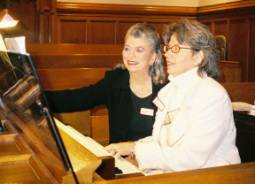 Exploring the elegant sounds of the Marygrove College Casavant organ. Present were Carl and MaryAnn Balduf, Anne and Fred Fahrner, Leonard Feerick, Dana Hull, John Lovegren, Edmund Price, Joann Rickards Clark and David Wigton. Acting President Carl Balduf reported on the results of the mail survey (relevant data shown on the left). He asked for calling committee volunteers and Joann Rickards Clark volunteered to head the committee. Balduf also mentioned that a Michigan Chapter Web page is available at www.cabaletta.com. He then thanked Joann Rickards Clark for hosting the meeting at both Hartford Memorial Baptist Church and at Marygrove College. A hearty round of applause followed. Balduf then raised a question about the 501c(3) status of the Chapter. It was opined within the group that this status is conferred through the national O.H.S. organization. Balduf said that he would check on this. Discussion then followed about dues for student members. A motion was made and seconded that student dues be $5. The motion carried. In the absence of Treasurer Terry Jankowski, who was out of town, Balduf read the treasurer report (printed below). The previous checking account balance was $1,327.13. A deposit of $100 was made on September 30 with the dues of those listed above, bringing the current balance to $1,427.13.